WSSC owns and maintains three dams which provide drinking water to our 1.8 million customers in Prince George’s and Montgomery County, Maryland. The Brighton and T. Howard Duckett Dams span the Patuxent River as well as three counties creating two reservoirs: Triadelphia and T. Howard Duckett. Additionally, WSSC owns and operates Little Seneca Dam. Triadelphia and T. Howard Duckett Reservoirs are surrounded by 6,000 acres of wooded property that comprise the WSSC-owned portion of the Patuxent Watershed or 7 percent of the total watershed. The two major tributaries to the Triadelphia Reservoir are the Upper Patuxent and Cattail Creek. The release from Brighton Dam and the Hawlings River are the major sources of water for T. Howard Duckett Reservoir. Together both reservoirs store 10.6 billion gallons of water with a combined surface area of 1,600 acres. 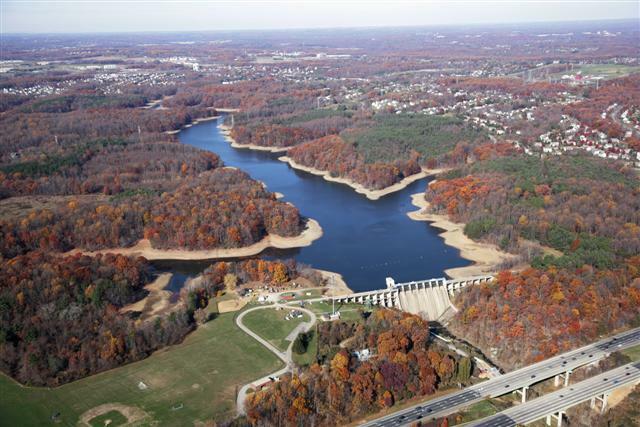 The Patuxent River Reservoirs supply water that is treated at the WSSC Patuxent Water Filtration Plant which provides drinking water to a portion of customers in Prince George’s and Montgomery counties. WSSC dams were erected and exist for the protection of the drinking water supply. When there is heavy and/or long-lasting rainfall, WSSC will routinely release water from the dam to protect the integrity of the structure. This is a standard and proactive measure. Since the dams were put into service, WSSC has lowered the stored water level by one billion gallons to offer a buffer to increase warning time during flooding conditions. The dams and reservoirs have always reduced the peak flooding levels downstream. Both dams always maintain a minimum flow-by to the Patuxent River even during droughts. The worse flooding event since the dams have been in operation was June 1972 in the aftermath of Hurricane Agnes. The Brighton Dam went into service in 1944 with the primary purpose of providing source drinking water for WSSC customers. Located on Brighton Dam Road, Brookeville, it spans the Patuxent River between Montgomery and Howard counties creating the Triadelphia Reservoir. The Brighton Dam has 13 tainter gates. Its reservoir capacity is approximately 6.3 billion gallons which are released into the Patuxent River, captured by T. Howard Duckett Reservoir and then sent to the Patuxent Water Filtration Plant for treatment. T. Howard Duckett Dam went into service in 1954 with the purpose of providing source drinking water for WSSC customers. Spanning the Patuxent River between Prince George’s and Howard counties, T. Howard Duckett Dam creates the T. Howard Duckett Reservoir. It is 13 miles downstream of the Brighton Dam and has seven tainter gates. Located just off I-95 north of the Capital Beltway, it is clearly visible to travelers. The reservoir holds approximately 5.7 billion gallons of source drinking water that is carried via the underground pipe to WSSC’s Patuxent Water Filtration Plant for treatment. The Patuxent Plant produces approximately 30 percent of the average daily needs for drinking water for WSSC customers. Located in Black Hill Regional Park which is operated by the Maryland National Capital Park and Planning Commission, Little Seneca Dam and Little Seneca Lake hold four billion gallons of water. This reservoir is part of the Washington Metropolitan Regional Water Supply. Water is released into Seneca Creek which travels to the Potomac River to provide water at the Region’s three water intakes operated by WSSC, Fairfax Water and the Army Corps of Engineers.